Tokyo, Japan, February 10, 2012 – 7knowledge Corporation, an innovative productivity application developer for tablet and smartphone devices, and its parent company MetaMoJi Corporation announce that 7notes with mazec for android got R25 Android App award. R25 Anadroid App award is for the coolest application targeted for young business people for the year. 7notes with mazec for android was elected as a grand prix award in business applications because of 7notes outstanding usability and effectiveness as note taking experience. 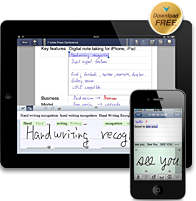 The 7notes proprietary state-of-the-art handwriting recognition software allows users to take notes on the go, using their fingers or a pen, and easily event switch between handwriting and keyboard entry with a single touch. Notes can be saved as different formats and stored or shared through Dropbox and Evernote. Standard iPad features include flexible note taking, a built-in spell checker, advanced writing prediction engine with autocorrect and auto-completion, and PDF document creation. 7Knowledge continues to offer solutions that eliminate barriers between smartphone users and their keyboards, with future plans to expand its 7notes for iPhone, iPad, and Android. If you would like more information on how to use 7notes Web Client within your organization, or to enhance your solution or product, then please contact us via telephone at +1-631-244-1466 or visit our website for more information and contact options.